I was just in the first standard of my first of the five schools where I have tried my luck when I first visited Malampuzha, and the second journey there was a school trip which happened in the fourth standard, the last year of the same school – the school was Vimala English Medium School, Perumbavoor; and yes Malampuzha has been a hot destination for a long time, which is why we visited the place again as a family trip just three or four years after this. So what has changed about this hot excursion destination from schools? Except for the beginning of the first amusement park in 1996 in the form of Fantasy Park, and the whole thing being made better for the tourists every year, nothing much. Yes, the place has gone better even as there have been more amusement parks all over the state and also more tourist destinations near other dams and reserviors. The place’s uniqueness might seem gone, but there is a certain amount of variety that runs through this place, and there is no doubt that it shall remain different from the others with the element of nostalgia associated with it. While talking about the journey one can’t cease talking about Indian Coffee House, as it is that place where we always stop, if there is the presence of that restaurant chain at the place we travel through. I would recommend the Poori Masala there, and mostly it is what I have, even as that world is more extensive. The Vegetable Cutlet might also impress a good number of the customers. Tea is always there in my list whatever I have, that is for sure. There is something about the place, and may be it is the trust, the faith that one has on a place which is not that much of a vampire of the stomach as you think about the other places providing food. Angamali and Chalakudi also have the same food chain, on the same side of the road. Once Pattikad is reached, the same destination or food is on the other side of the road, just after the town. They usually open between 7:15 AM and 7:30 AM as I have noticed. It was good to have breakfast there, as there was no time to think once Trichur was behind. The great road supported by the eighty rupees of awesomeness (toll) was over, and slowly the potholes began to take over, and soon there were less roads and more the lack of it, to quite a shocking extent. The shortest route from Cochin might be through Kaloor-Palarivattam-Edappally-Kalamassery-Aluva-Angamali-Koratty-Chalakudi-Potta-Trichur-Pattikkad-Vadakkanchery-Palakkad-Malampuzha, even as the fastest might be taking the Vallarpadam Terminal Road from Cochin and getting to Kalamassery joining the other vehicles to Aluva on the National Highway 47. The roads would be great in the beginning and all the way to Trichur, but later they were highly destructive to the vehicles, and considering the traffic which was on that road, it was quite shocking to see such a pathetic state of the path. Even the bigger trucks and buses were having a tough time, and the scooters and motor-bikes were taking the zigzag paths. It was to that pandemonium that we entered, and survived. There is no survival of the fittest here, but the survival of the luckiest. One of the trucks travelling on the front almost tried to lose their water tanks on us, but that Final Destination moment was luckily averted and the tanks fell into the potholes and stayed there as if they belonged there and caused further traffic blocks. The first thing about Malampuzha has undoubtedly the largest reservior in Keala. Located about ten or eleven kilometres from the town of Palakkad, this dam is one of the most visited tourist places in the Central Kerala (even as it would qualify as North too) for the last twenty years or so, as I can remember the rush which was here during my childhood. It might have reduced a bit due to the large number of tourist attractions coming up everywhere, and Fort Cochin, Kumarakom Backwaters have clearly overtaken this place as the favourite as the central area of Kerala is concerned, and not to forget the good number of malls which has come alive. If you look at any tourist package to Kerala, it might be difficult to see this place there, but I would say that it is a must, as long as one can take the roads which lead there. 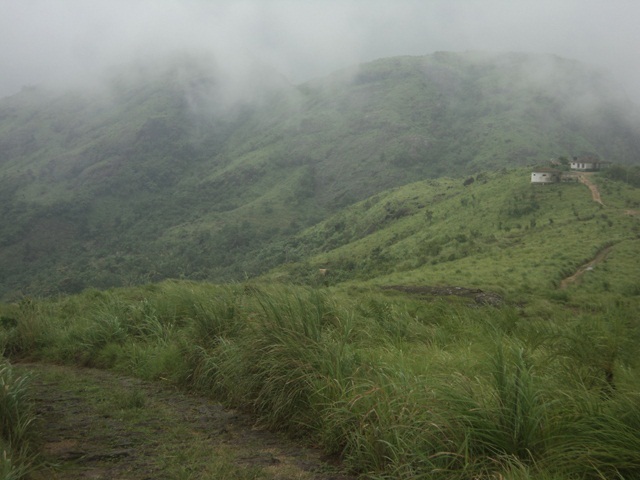 May be the journeys are mostly joined with an Idukki-Cheruthoni dam visit which is linked to Munnar as well as the Mattupetti Dam. But the fact remains that Malampuzha Dam is the real tourist destination which features a dam, as there is the freedom to take as many photos as one wishes to, while in most of the other dams, photography is prohibited, and so why would one think twice about choosing the right tourist place with a dam? It has the very beautiful hills of the Western Ghats in the background of the reservior which gives a beautiful shot for your camera from one side, while the other side has its own collection of hills as well as the gardens which are separated by the water which flows from the shutters of the dam and linked by two hanging bridges which is surely the first of its kind that I had walked through, followed by the ones in Singapore. Otherwise, one can take the ropeway to see the whole place around, and it is one of the first of its kind in Kerala, creating more interest in the tourists, even as there haven’t been much foreign tourists around when we visited. The dam is built across the Malampuzha River, a tributary of Kerala’s second longest river, Bharathappuzha. 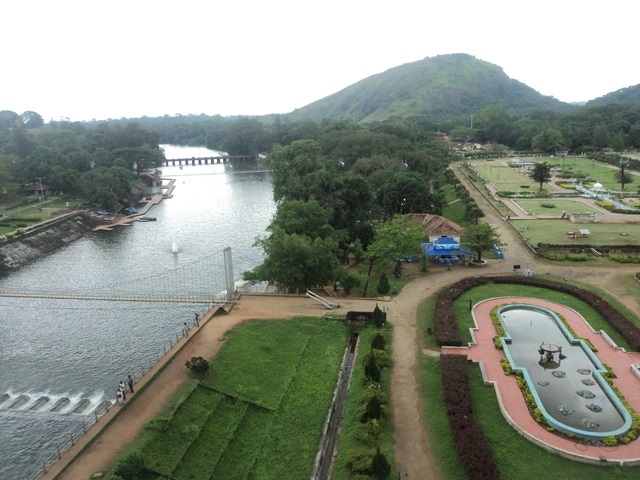 Due to the incredible beauty that surrounds the dam, and the climate of this season, this is very much suitable for a visit lasting the full day inside, followed by a journey to Fantasy Park and the Palakkad Fort along with the town the next day. You can use a full day with the dam and the garden as it is quite immense and it is better to take your time and enjoy. Around the structure and reservior of the dam, we can see the beautiful, well-maintained gardens and the boating facilities, all of which can be observed from the top of the dam or the ropeway. The other tourist attractions in the Malampuzha Garden includes a fish-shaped aquarium which I remember clearly from the old times, and the gigantic Yakshi (the female vampire vampire-like image belonging to this part of the world) which I can recollect too. There is also the swimming pool, snake park and the rock garden as I can remember. But the last visit was more about the dam, the reservoir and the beauty of nature which was around. The sculptures, gardens and even a wind mill came as extra additions. Well, you can visit the place for just the natural beauty itself, and there is no reason why one shouldn’t visit here, and as the road problems are concerned, one can take a luxury bus or a bigger car and travel in the early morning – the best choice to avoid the possible horror that the roads can give you. You can come here from the Tamil Nadu side too – as a journey from Coimbatore as it is very close and is the nearest airport while Palakkad Junction is the nearest railway station.